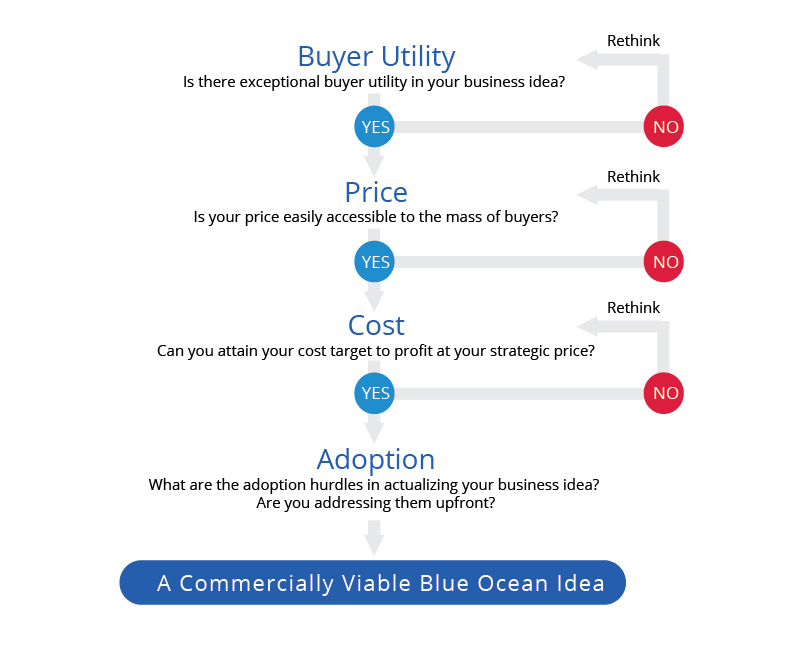 Companies need to build their blue ocean strategy in the sequence of buyer utility, price, cost, and adoption. This allows them to build a viable business model and ensure that a company profits from the blue ocean it is creating. W. Chan Kim and Renée Mauborgne argue that with an understanding of the right strategic sequence and of how to assess blue ocean ideas against the key criteria in that sequence, companies can dramatically reduce business model risk and ensure that both the company and its customers win as it creates new business terrain. Is there exceptional buyer utility in your business idea? Is your price easily accessible to the mass of buyers? Can you attain your cost target to profit at your strategic price? What are the adoption hurdles in actualizing your business idea? Are you addressing them upfront? Here Kim and Mauborgne articulate the strategic sequence of creating a commercially viable blue ocean idea. The starting point is buyer utility. Does your offering unlock exceptional utility? Is there a compelling reason for the mass of people to buy it? Second, is your offering priced to attract the mass of target buyers so that they have a compelling ability to pay for your offering? If it is not, they cannot buy it. Nor will the offering create irresistible market buzz. These first two steps address the revenue side of a company’s business model. They ensure that you create a leap in net buyer value. To secure the profit side you need to assess the third element: cost. The cost side of a company’s business model ensures that it creates a leap in value for itself in the form of profit—that is, the price of the offering minus the cost of production. The key question here is: Can you produce your offering at the target cost and still earn a healthy profit margin? You should not let costs drive prices. Nor should you scale down utility because high costs block your ability to profit at the strategic price. When the target cost cannot be met, you must either forgo the idea because the blue ocean won’t be profitable, or you must innovate your business model to hit the target cost. The last step in the sequence is to address adoption hurdles. What are the adoption hurdles in rolling out your idea? Have you addressed these up front? The formulation of blue ocean strategy is complete only when you can address adoption hurdles in the beginning to ensure the successful actualization of your idea.